Earlier, we discussed about how to rearrangement the relative relation of buttons in the scope of activity to do a custom auto-wrap layout. This time, we will also implement such a layout, but using a different approach by customizing a layout class. The layout class (linear, relative, list, grid, etc), is a subclass of view group, with particular way of placing its child views. There is a high-level talk about custom components, and this tutorial will bring in more details about how to custom a layout. There are two essential working functions for the layout function of view group, the onMeasure and the onLayout. The former can be used by parent to determinate the size of the view group, and the later do the place of child. With these two functions, layout can be well organized between parent and child. In this section, we’ll override a view group class, and implement a simple wrap layout logic. In order to get the size of child, measure should be called with proper argument first, then getMeasuredWidth and getMeasuredHeight can return the proper value. Child view should not be placed in the padding range of its parent. For simplicity, the first added child will be placed first. We can change the active_main.xls file to use a custom layout. 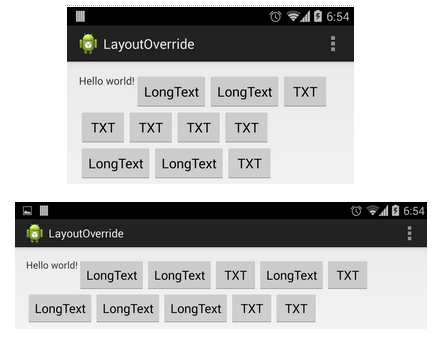 Just change the pre-created layout entry (such as RelativeLayout) to class path of the custom layout (com.example.layoutoverride.WrapLayout in this example). To view the layout results, beside the hello world TextView defined in layout xml file, another 10 Buttons are created with text of random length. There are two screenshots for the test, and it shows that the wrap works well. As we do not save the text of buttons for rotation event, these two screenshots have different button text. Nice info if you are into mobile apps. But some of the ideas could be usefull, or just to see how are things done on other platforms. Good article for sure. I tried this example and for some reasons it is not working …. do you have the full source code for this app? I want to create triangle shape not rectangular.. what should i have to do?